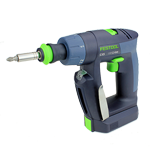 The popular Festool CXS Compact Cordless Drill has been updated with a larger capacity 2.6 Ah Lithium Ion battery, and an integrated Fuel Gauge. 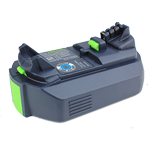 This newer battery is more compact and is compatible with older model CXS drills, plus the new version is back compatible to units with older existing 1.5 Ah batteries. The Fuel Gauge is integrated into the LED module for a quick reference of remaining battery life. Additionally this update version now is equipped with a larger 3/8" (10mm) chuck. 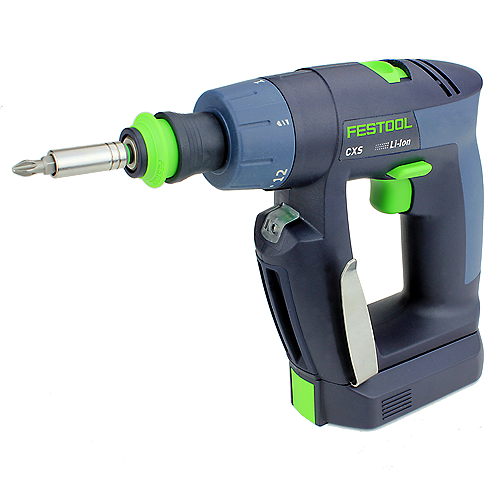 Plus you get all of the same great features that CXS users have come to love, including the 3-in-1 Fastfix Chuck System, which includes the Centrotec quick-change chuck, a more traditional Keyless for smooth shank bits, and a Right Angle Attachment (sold separately from the Basic version, but included in the Set version) for getting into corners and tight spaces. Keyless Chuck Capacity: 1/32" to 3/8"